Learn more about New York-based real estate developer, Pan Am Equities, efforts to construct a 419 unit "high-end" residential/mixed-use development at 2750-2800 W. Casitas Avenue in South Atwater Village. Click here to get the facts. This development is NOT in any way affiliated with Atwater Village Chamber of Commerce, Bow Tie Park or California State Parks. 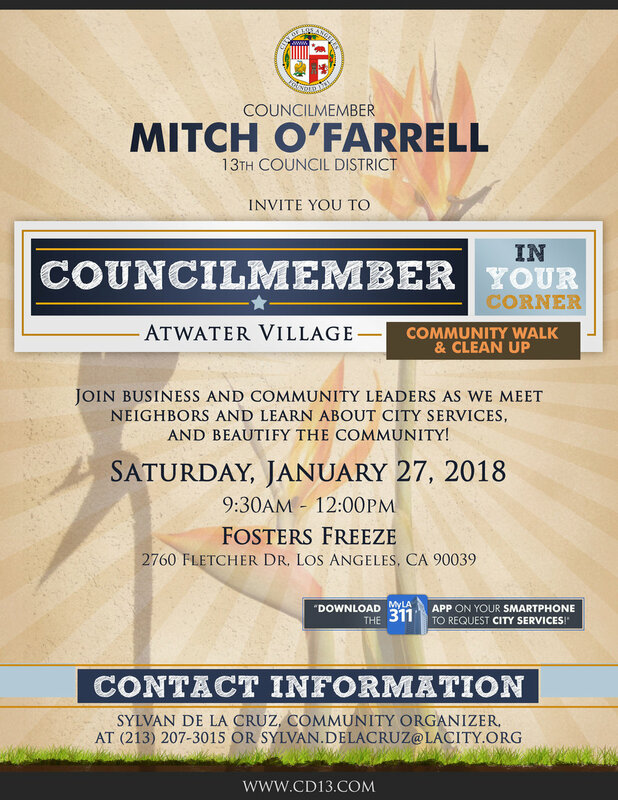 Council District 13 has hit the ground running in 2018, and they have organized a community clean-up, and door-to-door outreach event in Atwater Village south, and they would love for you to join. Come out and meet neighbors, make new friends, and volunteer for our community clean up. If you're interested, you can even volunteer to accompany Councilmember O'Farrell's staff members as they do outreach, and give out information about essential City services that are vital to keeping our communities safe and clean. They'll also have a CD 13 resource table, so please make sure to stop by and say hello! Atwater's Trick or Treat on the BOOlevard - October 27th!